It's time for another Wednesday WIP!! It's a good thing I have multiple projects going because my crocheted yellow chevron blanket is going to be a long long long process. I think you'd get bored of seeing the same thing every week! Well, I guess this project isn't that different. It's still chevron! And a blanket!! One of my sisters is expecting her second child in November. 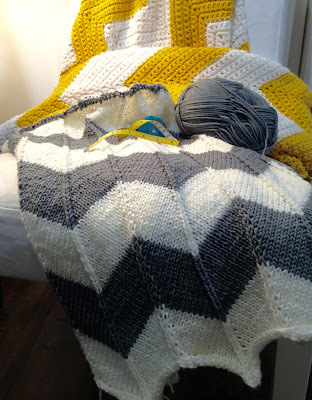 I offered to make a blanket of her choice and wouldn't you know, she picked chevron! What is it about those zig zags? The baby's room is all set up and the main theme is gray and white chevron with splashes of pink (it's a girl!). I've been loving the crochet chevron blanket that I've been making for myself so I was excited to start another one. I personally prefer knit blankets for babies rather than crocheted. 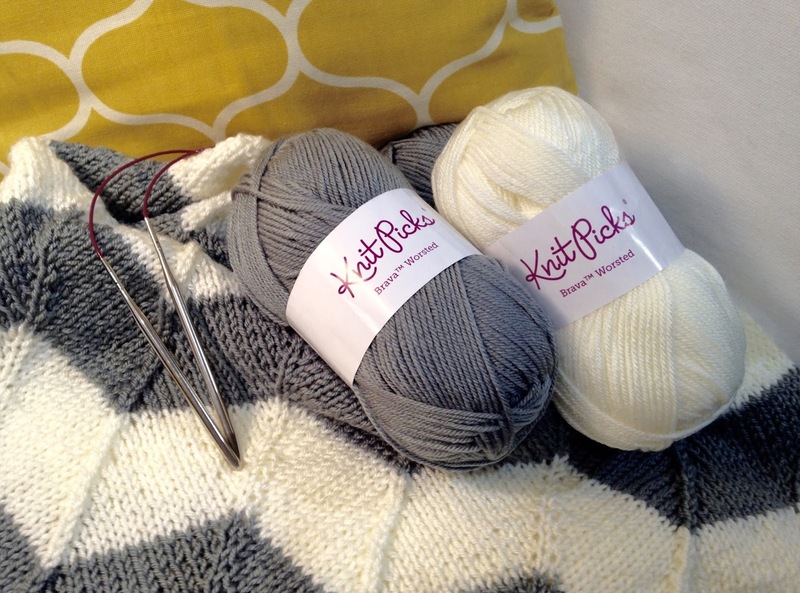 Knit has a lighter softer feel to me and an easier drape to wrap that bundle of joy in. Plus I needed to switch it up a little! I found a great free knit chevron pattern on Ravelry. 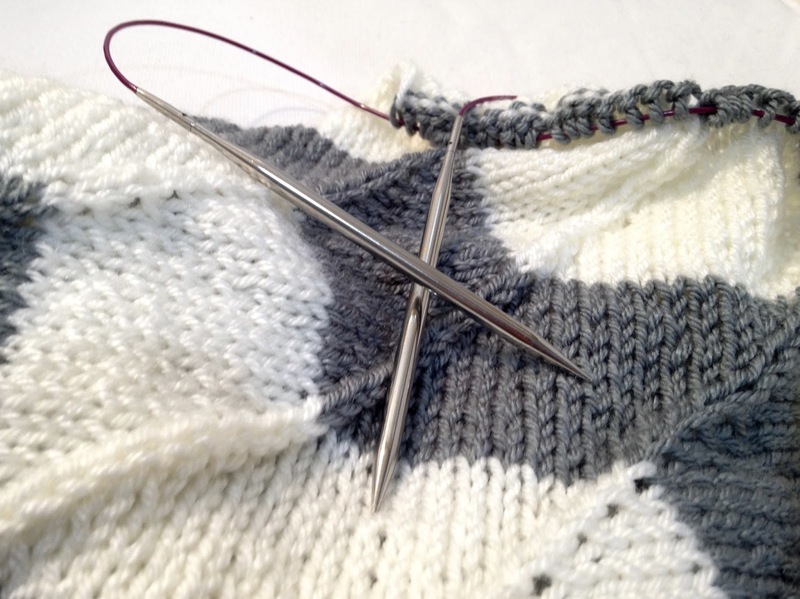 I highly recommend checking out the creators' website, Espace Tricot. They have a beautiful store in Montreal and, although I've never been there, it's on my places to visit if I ever plan a vacation! Is it weird that I think about knitting shops when thinking of vacations? Nah! I bet you do too! 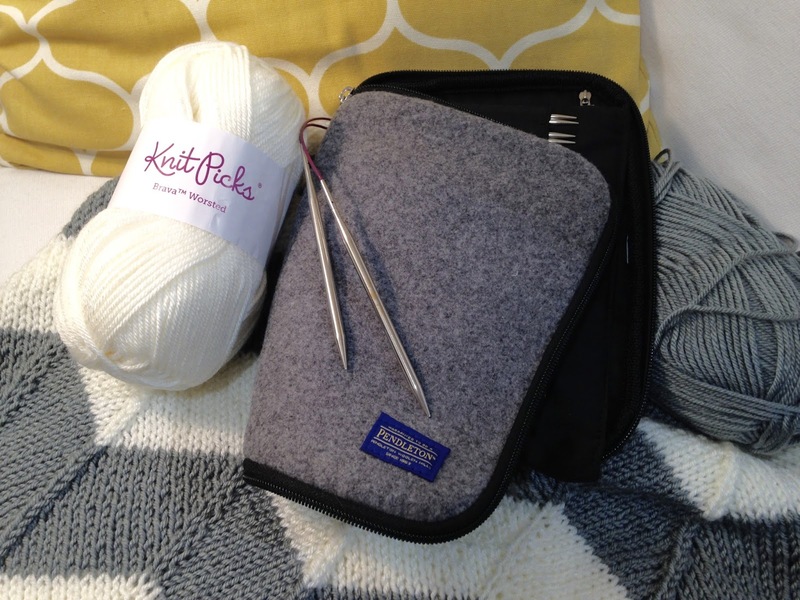 This beauty is being made with Knit Picks Brava worsted in white and silver. It's a quality acrylic yarn that I've used for two other baby blankets and a baby hat because of it's soft texture and easy washing care. Did I mention the cost? $2.99 for 218 yards! That's a good deal! Not to make this all about Knit Picks (Knit Picks is awesome!!) but I am also using their amazing Options Interchangeable Nickel Plated Circular Needles. I absolutely love this set! I store them in my Pendleton Zippered Needle Case. It's a great way to organize all those needles. Plus, it's pretty. 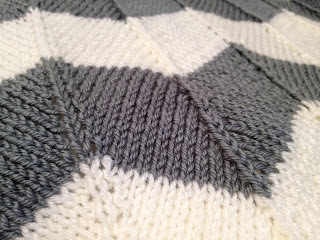 So far this blanket has been a treat to knit. It's going surprisingly fast and you can easily memorize the repeats. I have a little over a month to finish this and I have plans for a few more baby related projects to start. It's always exciting when a new baby arrives. They're so tiny and cute and you just want to cover them in wonderful handmade things! Typically the items are small too so it's not a big time sucker, that way you have more time to spend with the baby! And of course I can't forget about my nephew, the baby's big brother. I'm sure he wouldn't mind a handmade toy or cool new winter hat! My list of things to make is growing by the second! Good thing I have a huge stash of yarn all ready to be used. I hear it calling my name!